Of course, it’s nearly impossible to make to the Australian landscape look boring. But, rendered in the over-polished, pre-packed prestige style of director John Curran (The Painted Veil, Stone), Davidson’s journey appears meaningless, little more than a succession of pretty vistas for the dirt-caked trekker to squint at while having flashbacks of her childhood. Curran resists lingering, instead moving abruptly from one incident to another; the result is a journey through the geographic and psychological interior that sorely lacks a sense of introspection. 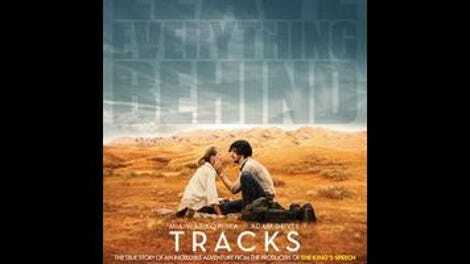 Tracks is the kind of fact-based movie that treats its end credits as a victory lap, with pictures taken by National Geographic photographer Rick Smolan used as evidence of the movie’s fidelity to Davidson’s story—the clothes, the locations, the resemblance of actors to the people they’re playing. Perhaps fidelity is the movie’s major problem; it seems unwilling to regard Davidson in any way except on the vague terms she sets out for herself. She’s taking the trip because she wants privacy, or because she prefers animals to people, or because it has something to do with her mother’s suicide. Who knows? Certainly not the filmmakers. Smolan—played as a blundering, overly talkative nebbish by Adam Driver—presents the more interesting character. From the moment he’s introduced, at a gathering of friends and acquaintances at the burned-out house where Davidson lives while learning to train camels, his attraction to her is self-evident. Davidson’s opaqueness actually gives Smolan’s character a clear dramatic arc; as a photojournalist, he is obsessed by the exotically beautiful—vast empty landscapes, Aboriginal rituals, Davidson herself—but must learn to respect its boundaries. It’s the rare case where a woman’s story would be more interesting if it were about the man documenting it.